Another of the immortals who's career is linked to jazz but who transcended simple categorizations and achieved status as an icon. 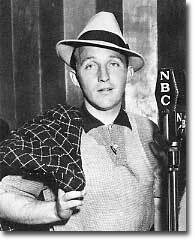 Bing Crosby remains today one of the most successful recording artists of all time with record sales estimated in the hundreds of millions worldwide. Crosby has had numerous jazz affiliations including with his first vocal group, The Rhythm Boys, but is normally classified as a pop music figure. Be that as it may, he remains associated with jazz through his many appearances with jazz greats, through his love for the music of jazz, and through his singing on several swinging jazz sides and albums. The nickname �Bing� came at an early age and is really short for �Bingo,� a character in the comic strip �The Bingville Bugle� which he loved to read as a child. Crosby never studied music seriously. He was blessed with a naturally warm, deep, resonant, and appealing voice and learned how to phrase with it almost by osmosis. In the early 30�s Crosby�s chumming around with the jazz greats of the day helped him pick up on jazz phrasing. He claimed, "I used to hang around The Dorseys and Bix and Bunny Berigan and Glenn Miller and Joe Venuti and Eddie Lang - all the musicians I admired - and I was having a helluva good time. I really had no idea that I was learning anything. But I certainly was." The talents of those he admired definitely affected his style. Ralph Gleason a noted Jazz writer once described Bing as �the personification of the whole Jazz movement � the relaxed, casual, natural, uninhibited approach to art.� The same description appeared to apply to Crosby the man as well. Although a superstar he failed to travel with a large entourage of sycophants and yes-men like many, who achieved a far less degree of stardom, have done and continue to do today. Crosby attended Gonzaga College in Spokane briefly pursuing a law degree. While at college he met Al Rinker, half brother to Mildred Bailey, already making a name for herself in jazz circles. The two formed a group with Bing playing drums and singing. They toured the vaudeville circuit to L.A. in 1927 and joined the Paul Whiteman band, where the two were soon teamed with another male vocalist Harry Barris. As the vocal trio known as The Rhythm Boys they soon achieved national popularity through their recordings with not only the Whitman orchestra, but with Bix Beiderbeck and Frankie Trumbaur in 1928 and the Dorsey brothers orchestra in 1929. The trio even cut one record in 1930 with the Duke Ellington orchestra called Three Little Words. While certainly musically significant by the affiliation with Ellington, one might think of the session's social significance as well. White vocal trios being recorded with black jazz orchestras was not the status quo in 1930. "The Rhythm Boys" even appeared with Ellington's orchestra in person. However, before one jumps to the conclusion that this was a group making a racial statement, unafraid to face public scrutiny, take into consideration this fact; when they appeared publically with Ellington, it was in black face. After making the film �The King Of Jazz� with Whiteman, Crosby left the band to work as a single. Occasional jazz recordings, in between pop sessions, radio, and film work, followed with Don Redman in 1932, Louis Armstrong and Jimmy Dorsey in 1936, Jack Teagarden in 1941, brother Bob Crosby in 1942, Louis Jordan in 1944, Eddie Heywood in 1945 and later many sessions and appearances with again Louis Armstrong and with Dixieland bands headed by Bob Scobey, Bob Haggart et al. Crosby�s success as a vocalist however did not come from his direct affiliations with jazz or jazzmen. His repertoire spanned country and western, or so called cowboy songs, religious recordings, and syrupy ballads. He became a near overnight sensation as a solo act in 1932 through a series of star radio appearances and a record breaking run on stage at New York's famed Paramount Theatre. 1932 also brought with it his appearance in a film called �The Big Broadcast� where he introduced his theme song, one in which he co wrote, called "Where the Blue of the Night Meets The Gold Of The Day.� The song became his identifying song and was heard for many years on the popular Kraft Music Hall program. Just before the American involvement in World War II Crosby began one of the most popular chapters of his career. Following three huge music hits in early 1940 he made the first of seven classic "Road" pictures, one of the most successful series in the history of motion pictures, beginning with "The Road to Singapore" also starring Bob Hope and Dorothy Lamour. Bing recorded his (and the record industry�s) biggest hit of all time in the spring of 1942. Irving Berlin�s �White Christmas� was released in October of the year and remained at the top of the charts for the duration of 1942. �White Christmas� was reissued around Christmas each year for nearly 20 years following and the song became the best selling single of all time, realizing an unprecedented 30 million copies, a benchmark unequalled for nearly 50 years. Bing won an Oscar for Best Actor for his portrayal of Father O'Malley in "Going My Way" in 1944. He became the first popular singer to achieve the award. He was nominated again for "The Bells of Saint Mary's" in 1945 and "The Country Girl" in 1954. �True Love� with Frank Sinatra and Grace Kelly was another hit. Released in 1956 the soundtrack contained the Armstrong � Crosby duet of �Now You Has Jazz.� Unfortunately, the airplay of the soundtrack overshadowed one of the most swinging releases of all time for Crosby. A session in which a young A&R man for Verve records named Buddy Bregman (who happened to be friends with Bing�s son) convinced �Old Groaner� to appear on, and proceeded to amaze the legend with his arrangements and band�s sound. The release was a poor seller but �Bing Sings Whilst Bregman Swings� remains one of the most swinging by "Der Bingle" of all time. Bing Crosby was also a pioneer in the use of new methods of reproducing himself. In 1946 he wanted to shift from live performance to recorded transcriptions for his weekly radio show on NBC sponsored by Kraft. NBC and ASCAP (Association of Screenwriters, Publishers, and Authors) however didn�t see it that way. The ASCAP union continued to reinforce the deeply rooted tradition of ensuring production of �live� radio shows for broadcast and NBC wasn�t willing to rock the boat. But the new ABC network was. It would pay Crosby $30,000 weekly to produce one recorded show per week. He would also get $40,000 from 400 independent stations for the rights to broadcast the 60-minute show, sent to them on 3-16-inch aluminum discs that played 10 minutes per side at 33-1/3 rpm. Crosby�s desire to change to recorded programming afforded him several advantages. Not only did it enable him to record at times more favorable to his schedule, he could eliminate mistakes and be in total control of timing the songs and shows. Since Bing Crosby Enterprises produced the show, he could also purchase better and more modern sound equipment and arrange the microphones how he saw fit. The 1600 records Crosby made, during his fifty one year career as a vocalist, have never been paralleled. Bing sold 500 million copies during his career second only to Elvis Presley. He sang on 4,000 radio shows from 1931 to 1962 and appeared in 100 movies. He appeared in 300 television programs from 1948 through 1977, ending with his 42nd consecutive Christmas special taped before his collapse and sudden death Oct. 14 after 18 holes on a golf course in Spain.